Um, I just wanted to post a picture of me and My Liesal, whom I love!!! Saturday: Spent the day trying to be productive. Got my paper written that was due on Monday. Went running for the first time in months!!! Supervised the preschool for Saturday Night Service, as I do every week. Came home and watched the 'stros loose the first game in the World Series. Monday: School, all day. It was good, but as always, long. Felt good to turn in my paper, but found myself overwhelmed by my New Testament class. It's so good, but the prof is so intense!! After class I headed to the church for a lovely free fried catfish dinner. Then around 6:15 met up with some friends and headed to the David Crowder Band concert. It was a free ticket and you got a free CD at the door. Shane & Shane were there too!! I heart Shane & Shane!!! The whole night was super fun. I went with Will and Rebecca. They are 2 of my favorite people in Houston. No matter what we are doing, the 3 of us always have a good time. 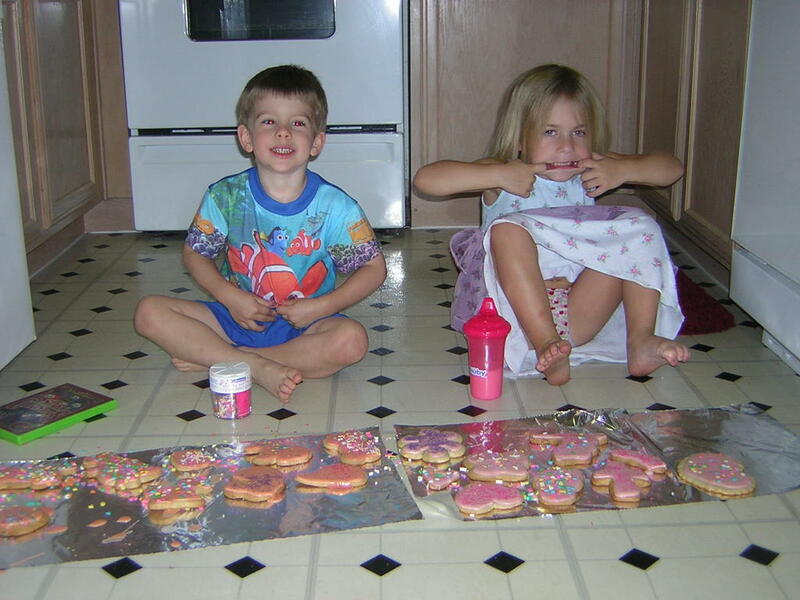 Will says that no matter where you are, as long as you have sprinkles it's a party. Rebecca and I say we are the sprinkles! Therefore, it's a party werever we are. Oh, I have to tell you this. On the way home, I'm not sure how this came up, but Will was driving and there were 3 of us in the backseat. All of a sudden he roles down all the windows, and opens the sun roof and decides we are going to play "Freeze Out". Now, I'm not sure if any of you are familiar with this game, I wasn't. Let me remind you that it has recently gotten colder here in Houston. It's been beautiful, a little slice of heaven I like to say. Anyways, it was past 11:30 and I would guess the temperature was in the 40s. And you all know the wind that is created when you are on the highway and going over 70!! It's not a good combination. Well the point is to see who can stand it the longest, without complaining! Since it was so late and had been such a long day, we were all histarical and just kept laughing. You know, you're laughing and you don't even really know why. It was rediculous, yet somehow fun!! My cheek was numb after a while. Finally, we talked him into rolling up the windows!! Oh, what a night! Today (Tuesday): Good work day, busy, meetings, got little things done here and there. Now Rebecca, and maybe Will are coming over for GG, Amazing Race, and the world series!! That's the past few days in review! Super Duper: Baylor Homecoming this weekend!!! Super Pooper: All the other things I should be doing this weekend. Official plans have been made. Sorry if you didn't get a vote in, but we are trying to make decisions so that the word can get out and everyone can be aware of where to be when. Noon (if you're in town, we understand that not that many people may be this early in the day, but still we wanted to make you all aware of the goings on) - Vitek's for lunch. Let us know if you want to join us so we can arrange where to meet up. 7:00 pm - Meet for dinner at Rudy's (on the circle at I-10). Again, all are welcome, spread the word!!! 9:00 pm - Bonfire/Peprally (note new location, you may want to go to the website for all the goings on of this night, it's supposed to be rather different from years past. Here's the link: http://www.baylor.edu/homecoming/index.php?id=32742 ). 10:30 pm - Post bonfire events are up for negotiation. Feel free to throw out any ideas, keep an open ear to hear if anything exciting is going on! I hope everyone is okay with all of this. Again, I'm so excited to see everyone!! I hope you can plan to join us for any or all of it!! Spread the word and let me know if you have anything to add to the plans! Till then, have a great week! So the deal is that I had refrained from shopping for a long time, I might even say, too long. And now I just can't stop. One might say I'm out of control! Let's recount. Thursday: Sunglasses, Astros shirt (had to purchase one now that I am a Houstonian and we are going to the world series, and tomorrow is "Go Astros" day at work!! ), and a fantabulous new pair of shoes. I wish I could show you the shoes. They are just simple little princess style and are completely covered in multicolored sequins!! I don't care if they match or not, I'm going to wear them!! All the time!! I'm so excited about them! So the deal is that now I'm a bit out of control. I have got to stop myself. I am on a budget and especially with Christmas coming up, I really need to stop!!! So this is it. I'm putting it in your hands. Do not, under any circumstances allow me to shop any more. If I slip up it will be your fault, all your fault!! So, a few weeks back, maybe even a month ago I posed a question, and asked for a response from those of you who read my blog. So, I know it's been a while, but let's try it again. If you could change your name, first, last, whatever you please, what would you change it to? Bonus question: What color (the color of this font) would you call this? Oh, another thing. Those of you coming to Homecoming, we are trying to gather a group (all are invited, spread the word) for dinner and then plan to head on to the Bonfire. Bush's, Rudy's, Fuddruckers, On the Border, Ninfa's have all been suggested. If you have a suggestion or would like to place a vote on any of the above, add that in your comment as well!! One more thing, in case you haven't read Laine's blog, we started a group on Facebook called "Blogging is the new Facebook". Be sure to go join!! And let me know if you would like to be an officer, and what title you would like, otherwise I'll make it up myself! Super Duper: my friend Liesal is starting a blog!!! Super Pooper: spending my weekend writing papers!! Sunday: I think I have already told you about how Sunday was a big Celebration Day that my church had been leading up to in the midst of this capital campaign we've had. We had one HUGE service under a ginormous tent in the parking lot (did I mention the tent was air conditioned). Anyways, we canceled all Sunday School on that morning, but of course still had classes for babies through 3 yr old who didn't attend the service. So this was a huge sacrifice that we were asking people to make to miss this monumental service. In appreciation we gave them all a box that was make completely out of chocolate and inside had 4 chocolate truffels. Oh yes, it was amazing. 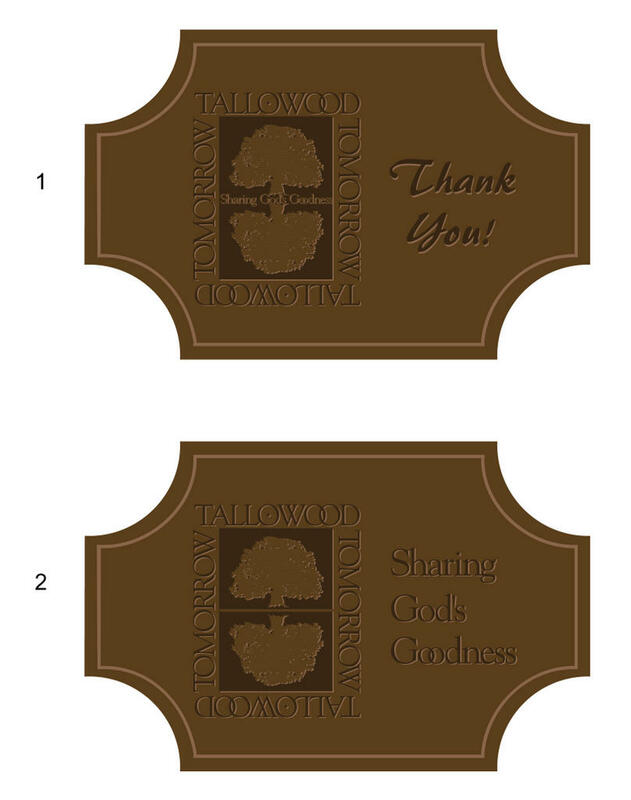 And the lids of the boxes were personalized with a Tallowood logo and the words "Thank You". Anywho, I headed home, after my feet were killing me, took a nice 2 hr nap, then awoke to study and watch the 'stros off and on! Monday: This is my early day. Had to get up around 6:15 to be ready to leave for seminary by 7:15. I had a major test in my 8:25 Systematic Theology class. I felt relatively good after the test. It was a basic essay test and I felt like I had covered the topics presented rather well!!! But then I went to my New Testament class that afternoon and had my world shattered when he handed back tests that we had taken last week. Honestly, I wasn't expecting much, I hadn't felt very good about this one, but it was worse than I had anticipated. I won't give you an exact number, but just know I only made a grade this low on 2 tests during my whole time at Baylor! I was crushed. I sat there and literally wanted to cry! But since I was in the middle of class I controlled myself. I sat there the first 30 min of class wanting to not pay attention and blaming the prof for the grade HE had given me, of course this was not the grade I had EARNED!!! All I could think about during class was that maybe seminary wasn't for me, maybe I'm not cut out for this, work and school. It's not supposed to work this way. If I study, and show up for class, and take good notes, I'm not supposed to do so poorly. I left there still rather disheartened and still not ready to tell anyone about my recent unsuccess. Usually I would call my mom right away and tell her how things went, and it wasn't that I was afraid of her response, it was that I honestly couldn't force myself to say it outloud yet, that would make it real (and fear of loosing it over the phone). So what is a girl to do, but go shopping. I wasn't really looking to spend a ton of money, but just needed a little something to make me smile! So I headed to Target to see what I could find. I did manage to pick up a nice flashy silver sequined sash/belt. Way cute!! Then I went to church and had a nice free Mexican meal!! It was deelish (pronounced DEE-lish...hahahahaha)! So having shopped and eaten, I was feelin better. I decided to head to my friend's where people were gathering to watch the 'stros!! It was a random combination of people, but that was okay. I'll spare you the details seeing as how this post is already getting long and I haven't even mentioned today (Tuesday), but the girl's house who I was at, was going through some major drama with a guy that kept calling her saying that she had "hit and run" him on his bike. It was a crazy evening, with the 'stros losing in the end (bummer). I finally went home at 11:00!! Tuesday: A fine day at work, my boss (well, one of them) paid for lunch, so that's always good. 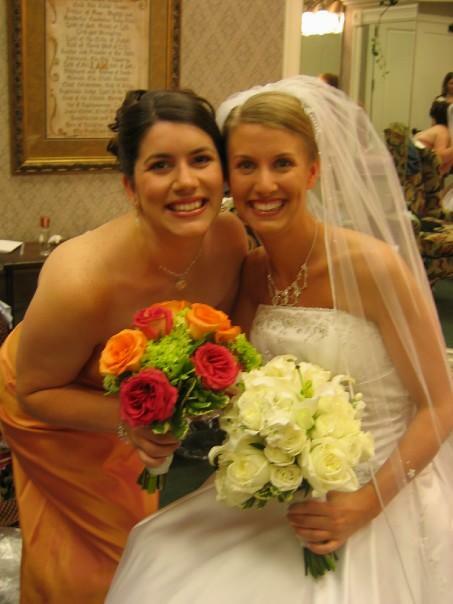 I love my Tuesdays because it's Gilmore Girls and Amazing Race, and even better, my friend Rebecca joins me for them!! Tonight I decided to make tacos for us for dinner. So then I decided to invite Will. It was fabulous. In the words of my sister, "Good food, good friends, good fellowship, good fun, good freakin' times!!" It really was nice! That's it...sorry it got so long winded. I do want to say that I'm so glad that my confessions inspired a few of you! It thoroughly encourages me to know that I'm not alone! I love you guys! It's no wonder we get along so well, that's why it's so hard to start new in a new place, it's tough to find people like you. Okay, I'm not going to get into that, but you know what I mean! Super Pooper: I have a paper do on Monday and I've only read about 1/4 of the book...ah well!!! Super Pooper: I didn't sit down all morning, I was walking around like a crazy woman, all the time rubbing blisters, and then for some strange reason my big toe started to hurt mid morning, really badly!! Super Duper: Did a little bit of tidying up yesterday. Super Pooper: Don't think my vacuum cleaner is really sucking up stuff!! Super Duper: Getting a Saturday night off and a Sunday night off to myself. Super Pooper: Having to study during that time. Super Duper: Winning at dominoes last night. Super Pooper: Playing another game with a person who is so competitive it takes all the fun out of it. Super Duper: The 'stros won today!!! Super Pooper: The Bears lost yesterday. Super Pooper: Having to leave the before the game in order to make it back on Saturday for church!! Super Duper: I got a raise!!! Super Pooper: It's only 3%...but really, I'm not complaining, anything is nice!! Super Pooper: Being the bad friend that doesn't return phone calls for like a year!! Super Pooper: I spend my only whole day off in class for 8 hrs straight!!! Okay, that's enough, besides, I'm supposed to be studying right now! Hmmmmm, who knows where this will go, but I've got some deep thoughts on my mind and thought I'd think through some stuff. Have you ever felt so blessed in your life and so undeserving of the blessing that you are scared about why the Lord has chosen to bless you in such a way? I mean seriously, it is my heart's desire to honor and glorify Him, but I know that I still fail daily. I break the heart of God on a daily basis. And still he bestows blessing upon blessing on me. No joke, I often wonder what He is preparing me for? Where is this path that He has me on leading me. But then I am reminded of something some preacher said, that the verse, "He is a light unto my path" means that we only get to see a very small part of our life at a time, we don't have a spotlight showing us what's up ahead. I believe that's were a little something called faith comes in. Oh, whoever said having faith is easy must have been smoking crack. There is nothing easy about it, and I'm convinced that is why that road is narrow and few walk down the path of righteousness. Oh Lord, find me faithful! One other thing on my mind tonight...marital status. I go back and forth on this. I have my days where I feel completly content and know that the Lord has me right where He wants me right now. I tell myself that I don't have time right now and that the Lord is still preparing me for that special someone, and I do 100% believe this. But then I have my moments where I desire an intimate relationship (and I don't really mean sexually, rather more emotionally). You know, someone who wants to know every detail about my day, someone who calls to make sure I made it home okay, someone who can just sit and watch tv with me, someone who will encourage me on the tough days, someone who will love me for who I am. Okay, I'll stop, if I think too much about it, it becomes real and I get a little sad. Like I said, for the most part I'm content and know this is a special time in my life that the Lord can use me in an amazing way...but a large part of me hopes that this "special time" doesn't last very long. I'm not sure if it's worse that I already have someone in mind, or if it's better than not having hope that there is anyone out there right for me....who knows? I think that's most of what's running through my head right now. Super Pooper: Didn't get as much studying done as I needed to, ooops!!! Let me start this post by making a confession. Okay, here it is, sometimes I want to make a post every day, but I force myself to skip a day so as not to "overpost". Whew...I'm so glad I got that off my chest. I think from now on, if I want to post, and I have the time to post, I'm going to post, so please, don't think less of me if I post too often, I'm sorry for being an "overposter", but that's just the way its going to be. Now that that's over with, on to the topic of the day - shopping. I have done so good with not spending money on clothes and shoes the past few months. Honestly, the first few months I was here I allowed myself to shop a little more, justifying that I needed some more professional clothing. But, I've done better now. Of course my mom purchasing a few things for me along the way has helped keep me from spending my own cash...but that was all down the drain today. It wasn't a large purchase, but a friend of mine drug me to Mega-Marshalls. I mean, I was kicking and screaming, begging her not to make me go (there is absolutly no truth in that statement). Somehow I walked out of there with a new little precious shrug and fabulous pants, and she didn't spend a penny. How is that possible? It's okay though...I really like both peices, especially the pants. 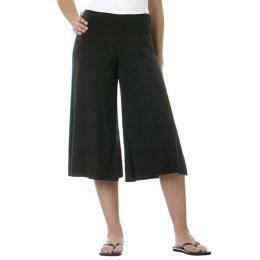 I know, you've all probably seen them, but they're the new thing, called Gaucho pants!! If you don't have a pair, I highly recommend them. I paid $12 at Marshalls for them, but in looking for this picture found out that they have some at Target (or at least online) for only $6.50!!! Isn't that amazing? I kinda wish I had only paid $6.50, but at least I'm wearing them right now!! Ya'll, they are so comfortable. Quite possibly my favorite purchase in years!! I love them. I'm a tad concerned that I won't ever want to take them off...they are just so wonderful. Ahh yes, amazing the impact a simple pair of pants can have on one's mood. So please, let me know if you decide to join me in this purchase, I promise, you won't regret it!! Super Duper: a new Pei Wei opened on the way home from church(work) to my apt...and I got to eat there tonight with 2 good friends!!! Super Pooper: too many bills in the mail today!!! I couldn't resist adding a few more pics of aunt's weekend!! 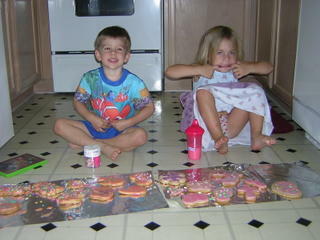 I love my ashy and my bray bray, how can you not agree that they are the 2 cutest 3 year olds ever? This is Ashlyn at Libby Lu's wearing as much pink as possible!! She loves being a princess!!! This is my silly, silly brady boy!! Monkeys are his favorite! 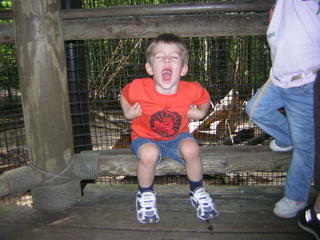 This is him in front of the monkey cage at the zoo, yes, he's acting like a monkey!! You can't help but love him!!! Super Duper: I got a ticket for pigskin today!!! Well, of course I must give a full report on my first annual Aunt's weekend 2005. I think the best way to tell you about it is to show you some of the pics and then just comment along side. 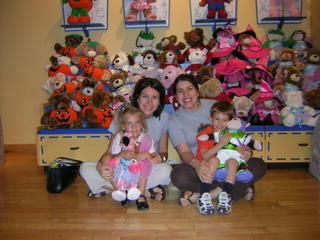 This is the four of us at Build-a-Bear!!! 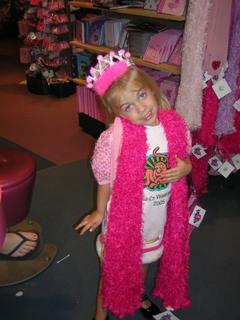 Ashlyn picked a pink flamingo with a fairy princess outfit and a blonde wig...it was hilarious! Brady got a monkey dressed up like Buzz Lightyear!! 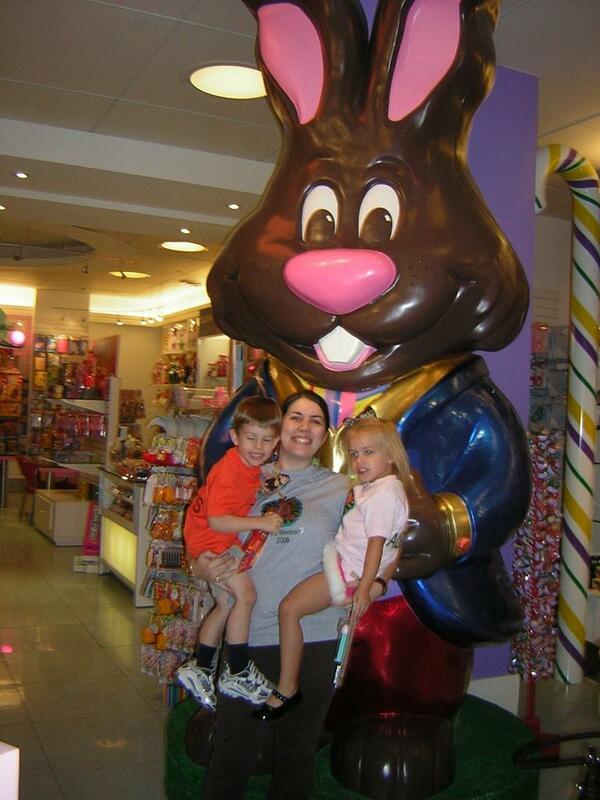 Here we are at Dylan's Candy Bar. That's right, we took the kids to a bar!! haha. It's a fabulously humongous store, you feel like you've walked into Willy Wonka!! !They have every candy and chocolate imaginable!!! I would be remiss if I didn't mention Ashlyn's new obsession with saying the pledge of allegience. 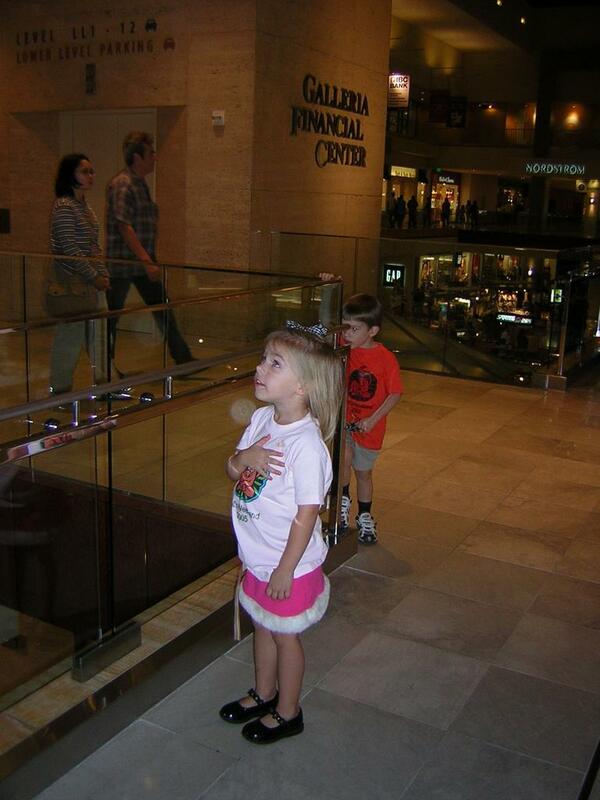 She stopped mid step in the middle of the Galleria and in front of everyone said the pledge. It was histarical!!! Kelly and I almost peed our pants!!! 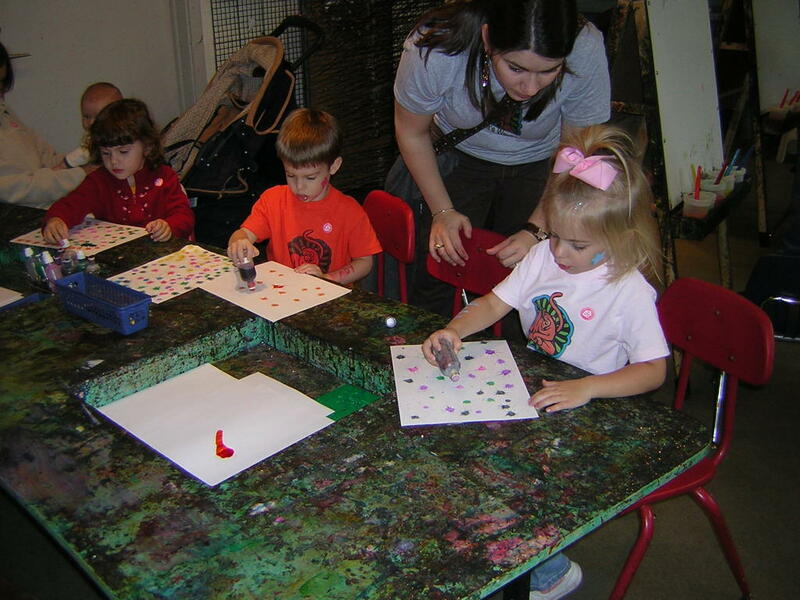 The kids really loved the Children's Museum. There was so much for them to do. We face painted, grocery shopped, did puzzles, and here they are painting!!! They were both so sweet and had such a great time!!! This is by far my favorite pic. The kids loved the zoo. 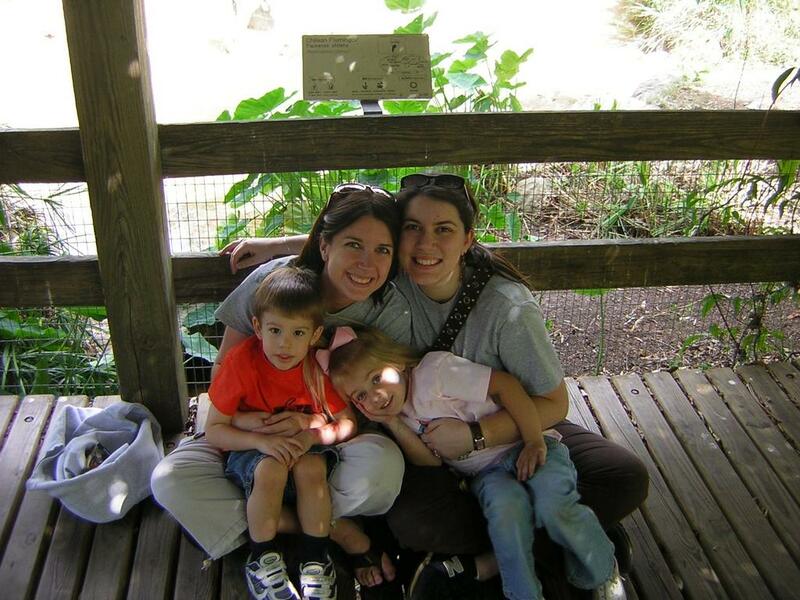 They each had their special animals that they wanted to see. Monkeys and flamingos were at the top of the list. By this time in the day they were pooped!!! I have to be honest, it was really hard for me to pick just a few pics. I adore my niece and nephew and I think all the pics are precious, but I figured you all just needed the bare minimum. If I can I'll post them on the web and you can go see the others for yourself!! It was a wonderful weekend and I spent way, way too much money, but it was worth it for a special occasion such as this. I would give you more details, but it'd just bore you and I wouldn't know where to stop anyways! hope you enjoy that insert!!! 6:30 - start studying for my New Testament test!!! sorry it's not more exciting, but that's my day!!! super duper: It's aunt's weekend tomorrow!!! had one neice and one nephew vs having one neice and 2 nephews!!! Life was good vs Life is good!!! Super Duper: Most likely getting to come to Baylor Homecoming (espcially cuz I didn't think I was going to get to)!!! Super Pooper: A busy week plus my first seminary test approaching. Just a quick note...I'm sad for my Baylor Bears. They played hard today, but missed some good opportunities. I'm still proud, but sad and yes, disappointed! !